An unstable planet has suddenly appeared from out of nowhere, and Blob, the Biologically Operated Being, has landed on the planet in order to repair its core before it explodes. The core consists of nine parts which you must find within the vast caverns of the planet – and there are 512 screens! Fortunately there is a teleportation network which you can use, but you need to know the correct codes. Blob flies around the caverns using hover pads, but some objects can't be picked up if you are using a pad, and you also can't use the teleports. You have a supply of platforms to raise your height, but these are limited. This is a wonderful game and an absolute joy to play. The game might be a bit too large, but exploring the caverns is such fun that it doesn't really matter. The Celos IV star range is under attack from the Zylons. You must stop them from destroying all the cities on the four planets of the Celos IV system, and in turn, destroy all of their bases within their own Procyon star range. The action sees you zooming over the planets, blasting Zylon fighters and destroyers, and then travelling to a space station for repairs – and doing it all over again, and again. Your spacecraft also has shields and a Surface Star Burst, or SSB, which is used to destroy Zylon bases. 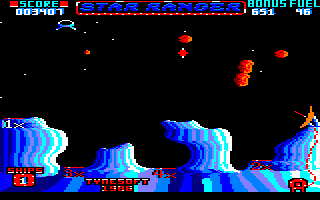 The graphics are fairly simple, although the explosions are spectacular and the scrolling of the planet's surface produces a great pseudo-3D effect. It's a game that will appeal to shoot-'em-up fans, although ultimately it is a bit repetitive in the long term. This is a version of the classic Lunar Lander with a few bells and whistles added. 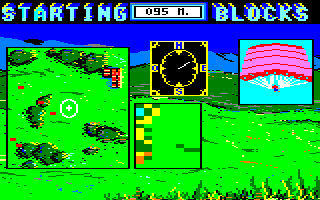 Firstly, the simple line-drawn graphics of the original have been replaced by much more colourful graphics. The sound effects are decent as well, and there's the added problem of dodging flying rocks. There's only one screen, though, in which you have to land your spacecraft on four landing areas – misjudge the landing, though, and you lose one of your six lives. You've also got to watch your fuel level! 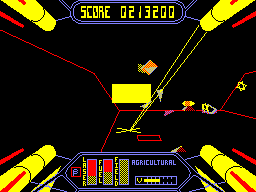 The second level (using the same screen) is harder, as you must also avoid laser beams. Sadly, the difficulty is so high that it's doubtful that you will complete the second level. Fast and furious shoot-'em-up action is what you'll get in this game. Pilot your spaceship through four levels of mayhem and dodge the waves of aliens and scenery, as well as all the bullets that are fired in your general direction. Every so often, you can collect bonus icons to improve your firepower, and as well as an end-of-level monster, you also have to deal with a similarly powerful alien spaceship halfway through each level. In short, nearly all of the ingredients of a typical shoot-'em-up can be found in this game. 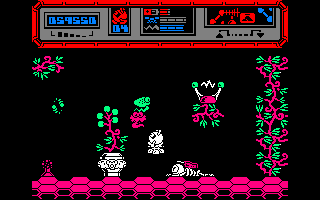 Although there is no music to listen to, and there are only four levels, the graphics are beautiful and the scrolling is very smooth, even when there are a lot of aliens on the screen, and it's definitely a game that is well worth checking out. There is also a 128K edition which contains lots of enhancements to make it even better! Watch YouTube videos of this game by: Xyphoe (128K edition), ZEUSDAZ (128K edition). 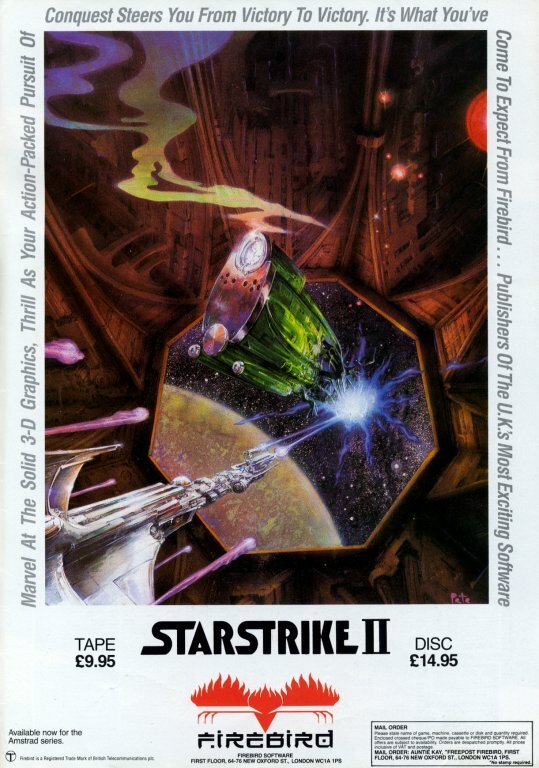 The Federation is planning a pre-emptive strike on the Outsiders, using their new generation Starstrike II spaceship. This will not be an easy task, as there are 22 Outsider planets to be penetrated, and they are spread across five solar systems. Each planet is either agricultural, industrial or military, which determines how heavily defended it is and what types of gameplay you will be playing. Your fuel and shields are limited, although fuel can be used to replenish your shields. Fortunately you can replenish both by returning to your support module. This shoot-'em-up is a big advancement on its predecessor, with significantly improved 3D graphics and a greater variety in the gameplay – definitely a game that is not to be missed! Five events are bundled into this game; the 400m sprint, parachuting, the 50m swim, the ski jump, and track cycling. For a game that fills up nearly an entire disc, that's not a lot! Four of the events involve some furious joystick waggling, although thankfully the keyboard can also be used. The parachuting event involves positioning yourself to land on a target, while the ski jump requires both joystick waggling and ensuring that you land correctly. You can practice the events, or play all five at once, competing as either Africa, America, Europe, or Asia and Oceania. The game as a whole isn't bad, although the combination of events seems rather strange. The graphics are fairly good in most of the events and the music at the start of the game is also nice. An alien syndicate led by Jabba McGut has stolen the Earth's only supply of 25 extra-special alloys, and is now threatening life on Earth. Only a Marine Corps Star Trooper such as you will be tough enough for a mission as dangerous as this. It is your aim to recover the alloys and return them to Earth. There are five missions with five alloys of the same colour to recover in each one. You must wander around a labyrinth of corridors and lifts to find the alloys, while shooting the aliens that patrol the labyrinth. You'll also have to find keys to let you pass through force fields and use the teleportation units. 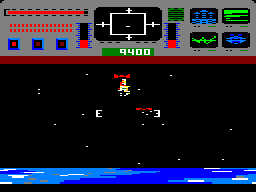 The graphics are colourful and well drawn, and the sound effects are OK, but you only have one life, and all the missions are effectively the same. 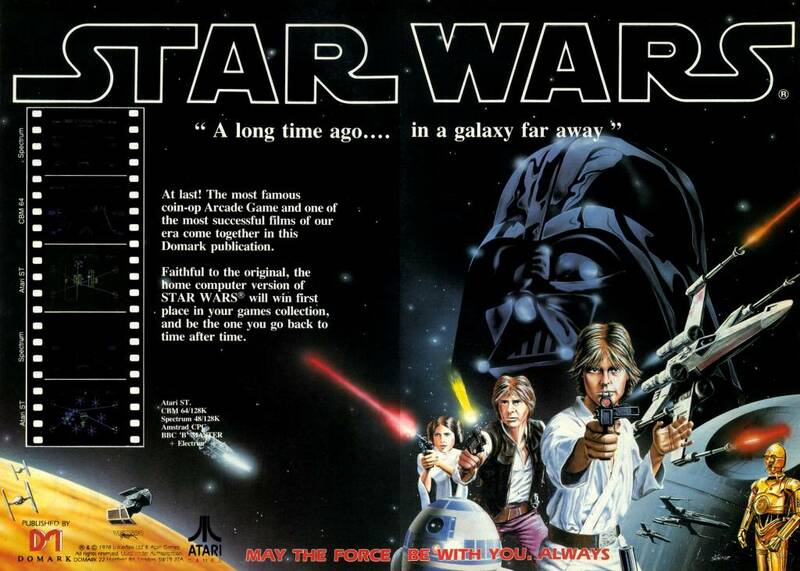 As Luke Skywalker, you must take on the military might of the Imperial Death Star in your X-Wing. 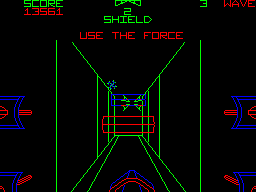 Viewed from a first person perspective, you first engage Darth Vader and his fleet of TIE fighters, shooting them and their fireballs to protect your limited shields. Then on to the military station's surface dodging and destroying its defensive turrets, and finally into the trench, avoiding the various protrusions and obligatory fireballs until you are finally able to attempt to launch your torpedoes down the exhaust shaft to blow the Empire's pride and joy to kingdom come. Failure results in a restart – thankfully, the difficulty is configurable. A brilliant, albeit simple looking game that's a must for every Star Wars fan. See also: The Empire Strikes Back, Return of the Jedi, Star Wars Droids. Watch YouTube videos of this game by: jgonza, Xyphoe. C-3PO and his companion R2-D2 have been imprisoned and must escape from their captors. 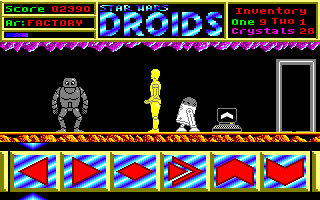 The base consists of eight levels, and C-3PO and R2-D2 must work their way up the levels by unlocking the barriers and lifts. You'll find computer terminals next to them, and if R2-D2 logs on to them, you play a Simon-like memory game where you must memorise two sequences and repeat them correctly if you want to gain access. Of course, there are also a lot of robots and other hazards to impede your progress and reduce your energy. The graphics are very well done with lots of detail, and the tune on the menu is really groovy! However, the gameplay is very monotonous, and the method of selecting icons to perform actions is both awkward and frustrating. See also: The Empire Strikes Back, Return of the Jedi, Star Wars. 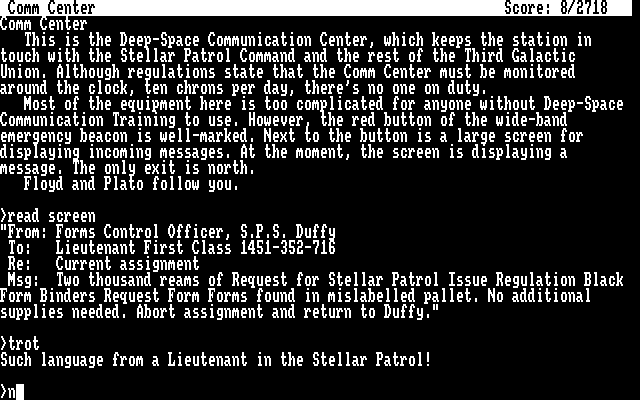 After your heroic mission in Planetfall, you are now a Lieutenant First Class on the Stellar Patrol Ship Duffy, but your latest assignment is ridiculously mundane – go to a nearby space station to pick up a supply of forms. When you get there (accompanied by your robotic friend, Floyd), the station is completely deserted, most of the machinery is going crazy, and an alien ship has brought something rather nasty with it. Of course, you've got to save the station from being taken over by it. The sense of foreboding and isolation pervades this text adventure, which increases the difficulty level considerably with respect to its predecessor – and this is the main reason why I don't like it as much. It's still very good, though.